These five pieces were originally composed for the lute, and have here been transcribed for the guitar by Brian Jeffery from the original tablature. The collection was previously published by Oxford University Press and has now been assigned to Tecla Editions. 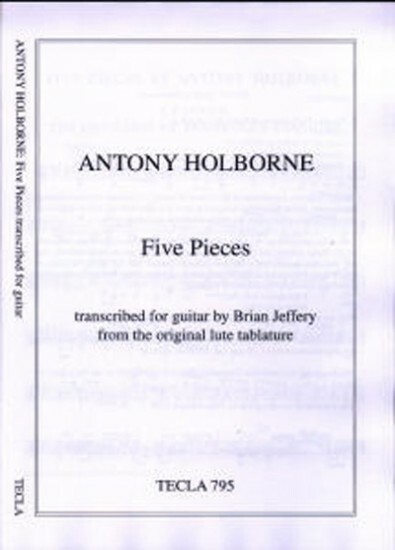 Antony Holborne, a gentleman at the court of Elizabeth I, composed for many different instruments. Of all Elizabethan composers, he would have been the first to approve of the transcription of his pieces for other instruments such as the guitar. This collection is one of a series of seven titles originally published by Oxford University Press, all of the lute music arranged for guitar by Brian Jeffery. First published by Tecla in 1995. This is music from the era of Shakespeare.